In a talent scarcity situation where the demand for top talent exceeds the supply, I advocate a “small batch, high touch, high tech” hiring model. Done properly, you only need 15-20 prospects at the top of the funnel to wind up with 2-3 strong finalists at the bottom. Since you’re starting with such a small target list, exceptional recruiting skills are needed to maximize response rates and minimize opt-outs. 1. Performance Qualified. This means prospects are capable and motivated to do the actual work required. That’s why I define the job as a series of performance objectives rather than a list of skills. This critical step opens the search to more diverse and high potential talent who have a different mix of skills. 2. Possess the Achiever Pattern. This indicates the person is in the top half or better of his or her peer group. These people will pop out of your searches just by adding job specific award and recognition terms to your strings. 3. Career Opportunity. When prospects naturally see the job as a career move, response rates increase dramatically. An obvious career move is typically some combination of a better title, better industry, faster growth or more meaningful work. 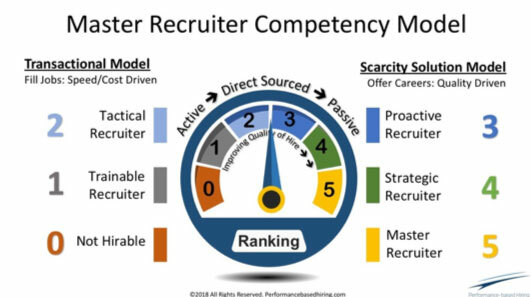 Our new Master Recruiter Competency Model defines all of the skills necessary to attract, recruit, assess and close these people. But rather than describing the specific competencies, it’s more important to first understand the model and the ranking system. This is shown in the graphic. The 0-5 ranking scale divides the recruiting process into two parts. The left hand side represents the more traditional “weed out” transactional process. We’ve found this is only useful for filling high volume “rank and file” jobs when there is a surplus of top talent. The right side emphasizes an “attract in” career consulting approach. This is essential for filling critical jobs and when the demand for talent is greater than the supply. Understanding the ranking system will help clarify the major differences in the Transactional Model and Scarcity Solution Model. A Level 1 - Recruiter-in-Training, has the ability to quickly become a Level 2 - Tactical Recruiter. These types of recruiters spend most of their effort posting jobs and using direct sourcing tools to find active candidates. The matching is done largely with skills and filtering candidates on interest, location and compensation. This is a transactional model with becoming more efficient as the primary metric of success. Shifting to the raise the talent bar consultative model on the right requires recruiters to embrace the “small batch, high touch, high tech” philosophy. This starts by being more proactive (Level 3) identifying ideal prospects and building talent pools and deep networks. A Level 4 – Strategic Recruiter takes this further using the latest technology, coupled with candidate profiling, workforce planning and a full talent market approach to find the strongest talent more quickly. A Level 5 – Master Recruiter not only does all of this on a consistent basis but also convinces hiring managers and company leaders to embrace the approach. Know the job, not the job description: This is the tipping point for gaining trust with both the hiring manager and the prospect and for getting strong referrals. Figuring out the real job starts by asking the hiring manager to describe the job as a series of major objectives and sub-tasks rather than a list of skills and experiences. Talent Centric Sourcing: You need to fish where the big fish hang out. That’s why I suggest 80% of a recruiter’s time should be focused on direct sourcing and developing referrals with the balance on writing compelling job postings. Regardless of sourcing channel though, it’s not the response rates that matter, it’s the response rates of the best talent. This is why customized job specific messaging is so important. Interviewing: The best recruiters can recognize talent, lead panel interviews and conduct formal debriefing sessions. Strong assessment skills are also essential for demonstrating to prospects the career opportunity and as a way to minimize opt-outs and rejected offers. Recruiting and Closing: It takes sophisticated recruiting and selling skills to attract and hire a top tier person who will likely get a counter-offer or a competitive offer. The process starts and ends with persistence, not letting a prospect say “no” or opt-out midstream or reject an offer until she/he fully understands the career opportunity inherent in your offer compared to everything else being considered. 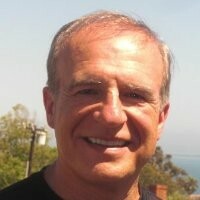 I contend that a transactional recruiter’s days are numbered. While it’s not easy to become a master recruiter, the impact on the recruiter, every candidate and every hiring manager will be game changing. Making the shift starts by knowing what you don’t know. Often this is the biggest gap of them all.